Lifetime Health Cover (LHC) is a Government Initiative aimed at encouraging people to take out private hospital cover earlier in life, and maintain it. If you don’t take out private Hospital cover before 1 July after you turn 31, you’ll pay a 2% loading on top of your normal hospital premium for each year you don’t have hospital cover (up to a maximum of 70%). The loading applies for 10 years of continuous hospital cover. For every year you put off signing up for Hospital cover, another 2% will be added. 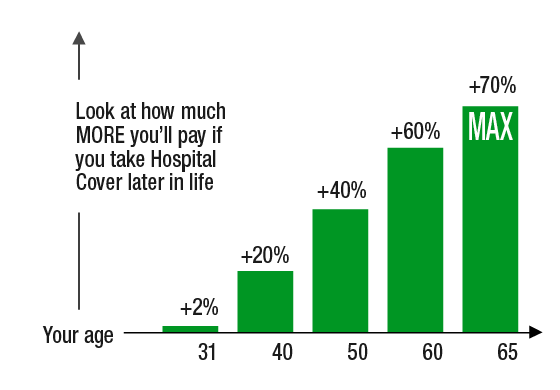 So if you wait until you’re 40, you’ll pay 20% more than someone on the same cover who joined when they were 31. Avoid LHC with a hospital cover that suits you. Join any nib hospital cover before 1 July following your 31st birthday. As long as you keep your private hospital cover, you can avoid paying the 2% annual loading. Lifetime Health Cover loading only applies to the hospital portion of your premiums on a combined cover and does not apply to Extras cover or Ambulance only cover. Q: Who does the LHC apply to? Migrated to Australia and don't take out private hospital cover within 12 months of being registered for full Medicare benefits. Q: How does LHC loading affect couples and families? A: If you and your partner have been without private hospital cover for different lengths of time, your LHC loading is calculated by averaging out the two. For example, if you’re paying a 40% loading and your partner has a 10% loading, that will be averaged out to 25% on a couple or family policy. Q: What if my birthday falls in the second half of the year? A: Once you turn 31, you have until the following 1 July to purchase hospital cover before the 2% loading applies. So if you turned 31 on 8 August 2018 for example, you’ll have until 1 July 2019 to join before the loading catches up with you. Q: When do I stop paying the LHC loading? A: If you take out private hospital cover after 1 July following your 31st birthday and Lifetime Health Cover loading is applied to your health cover when you join, you will need to pay this loading for 10 consecutive years before it ceases to apply. Once the 10 year mark is reached on your policy, a letter will be sent out confirming your new premium amount. Anyone else on the policy who is eligible for this removal will also be contacted at this time. If you don't hear from us, and feel you are eligible for the premium reduction, please contact us. Q: What if I am switching between health funds? A: To avoid using up any of the 1,094 permitted days (one day short of three years) you can be without hospital cover during your lifetime, we recommend you keep your cover with your old fund until the date you transfer to us. We make switching easy, we’ll even handle the break-up call for you. For more information, see our switching page. If you already have an LHC loading, it will move with you. Q: What if I suspend my cover? A: Suspending your policy won't affect your LHC status. While you won't be able to claim on services provided in this time and you won't be paying your premiums for the duration of the suspension, you'll still be classed as maintaining your cover. See Suspend or Resume Your Policy or contact us for more information. Q: What if I am going overseas? A: If you're going to be out of Australia for 2 months to 24 months, you can apply to suspend your health cover. If your request is approved, your LHC loading level will not be affected and, if you take out travel insurance, you'll avoid waiting periods for pre-existing hospital conditions when you return to Australia. If you anticipate being out of the country for at least a year and decide to cancel your health insurance, or need to move to our Expat Health Insurance, the only time that will count towards your 1094 permitted days will be any periods of 90 days or more you spend in Australia, per visit. If you're in the country for less than 90 days, you'll still be counted as being overseas and won't affect your level of loading. Q: What if I’m a new migrant to Australia? A: You'll have until either 1 July following your 31st birthday or until the one-year anniversary of your full Medicare registration (whichever is the later) to get private hospital insurance and avoid an LHC loading. If you're over 31 and you'll be overseas on your Medicare anniversary (if you registered with Medicare on or after 1 July 2009) you won't be affected by the loading, provided you take out private hospital cover within 12 months of your return to Australia. If you don't have private hospital cover by this new anniversary, you’ll have an LHC loading of 2% added to your hospital cover premium for each year you are aged over 30 when you take out private health insurance. Q: What is certified age of entry? A: When you purchase health insurance for the first time, you are given a ‘certified age of entry’ (CAE) so that we can determine what your premium is and if you need to pay any LHC. The CAE is based on the age you are when you first take out Hospital cover. If you purchase Hospital cover before 1 July following your 31st birthday, you’ll be given a CAE of 30 and won’t have to pay any LHC. If you were to get Hospital cover after your 31st birthday, your CAE is your age you were on 1 July before you were covered. For example, Kate turns 39 on 6 March 2019, and purchases Hospital cover for the first time on 10 June 2019. On the 1 July before Kate first purchased Hospital cover she was aged 38, so her lifetime health cover age is 38. Her loading will be 16%, which is a 2% loading for each year she is aged over 30 without having Hospital cover. What’s the Lifetime Health Cover Loading? Lifetime Health Cover: I've turned 31 this year, what does that mean for private health insurance?